Indiana waterparks all have varying attractions which comprise exhilarating slides, wave pools, lazy rivers, and other water rides and games. Many of them even have designated spaces for toddlers and younger patrons, with age-appropriate swimming pools, lily pads, and more. Holiday World & Splashin’ Safari offers so many complimentary aspects such as free sunscreen, parking, soft drinks, and WiFi in addition to their extensive array of roller coasters and waterslides. The most popular attractions are water coasters Wildebeest and Mammoth. Mammoth is certified by Guinness World Records as the world’s longest water coaster. Spend your day floating down the Bahari River, riding the surf in the Bahari Wave Pool, or taking the little one(s) on the many age-appropriate attractions that are available there. Popular rides for visitors of all ages range from the Thunderbird Steel Roller Coaster and the Voyage to the Raven and the Legend. There are several themed sections in the park, including the 4th of July, Halloween, Thanksgiving, and Christmas. 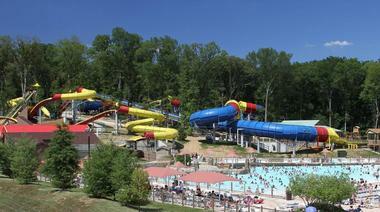 There’s no better way to spend a hot summer day with you family than at Deep River Waterpark. 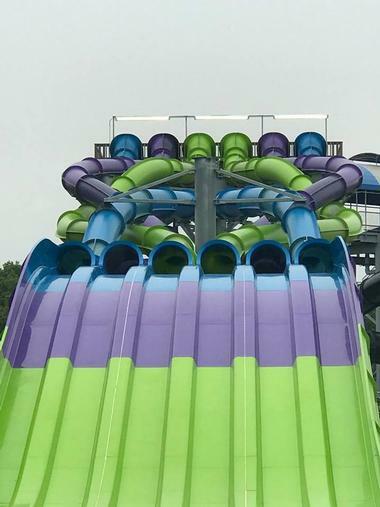 The park opened in 1995 with a wave pool, a couple of water slides, and a lazy river; today, you’ll be able to enjoy exciting additions such as their three dark ride slide complex called Storm, the 60-foot drop on the Dragon, and the six-lane mat slide racer Kraken. Visitors of all ages love the interactive rides and games, including the outdoor ice plaza with skating rink which is open in the winter. Other amenities such as food stands, picnic spaces, free parking, additional restrooms, and shaded structures are available throughout the park. A summer staple for residents as well as visitors, Freedom Springs Greenwood Aquatics Park is adored by guests of all ages. You’ll love relaxing in the island-type atmosphere where you can indulge in fun foods, take a break in one of their cabanas, or splash around in the water slides. Attractions include tube slides, body slides, a lap pool, a lazy river, diving boards, and a splash/ play area for infants and toddlers. The center is also popular for their classes such as swim lessons, water aerobics, and their aqua walk. There are several events held at the park including live music performances, movie screenings, adults-only movie nights, and their renowned Puppy POOLooza event which marks the end of the season. 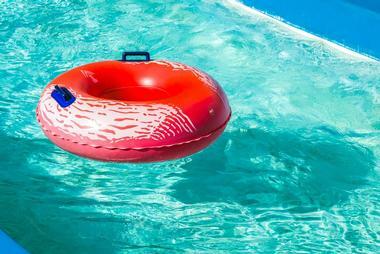 Ideal Beach Water Park is a wonderful, fun-filled attraction in Indiana. 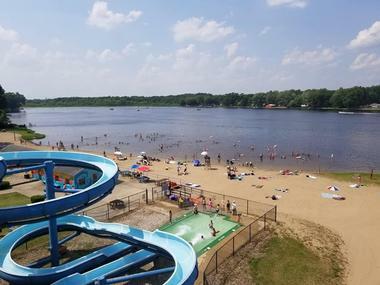 Residents and visitors find themselves spending their entire summer there, enjoying the lakefront beach, riding the corkscrew water slides, and enjoying the sunny beach atmosphere. Additional amenities that are available for guests to use include sand volleyball courts, designated picnic areas, concession stands, and a playground that younger visitors love spending hours at. With extremely low admission fees compared to other waterparks in Indiana, Ideal Beach Water Park is a popular choice for many. Please keep in mind that there is a minimum height requirement to get on the slides as well as a swimsuit requirement to get in chlorinated waters. The Marion Splash House is a family-friendly water park that is open to public visitors of all ages. 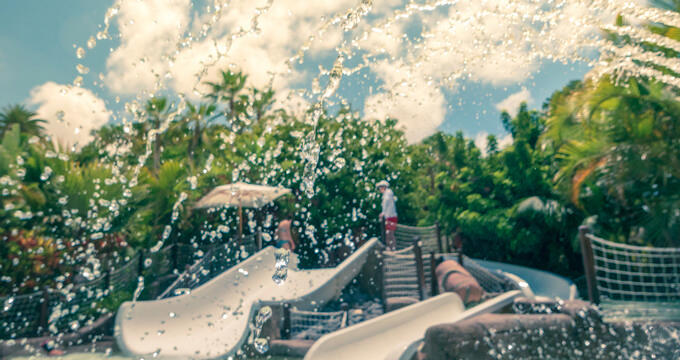 There are so many attractions there which are suitable for all ages, ranging from a bucket water drop and play pad for the little ones to a big flush slide and two racer slides for older guests. 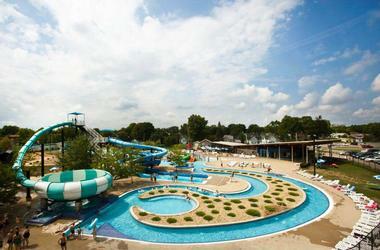 Other fun aspects of Marion Splash House include a large wave pool, a lazy river, and a separate kiddie play area. Additional amenities include cabana rentals, locker rentals, several concession stands, and shaded seating throughout the park. The park is a fun-filled place for the entire family and guarantees that everyone will have an amazing day while there. Pine Lake Waterpark was the swimming hole of choice for residents and visitors in Berne, Indiana for over sixty years. It has gone through several changes in management and renovations to their attractions since that time, ensuring that families continue to have a fun and safe place to build memories every summer. 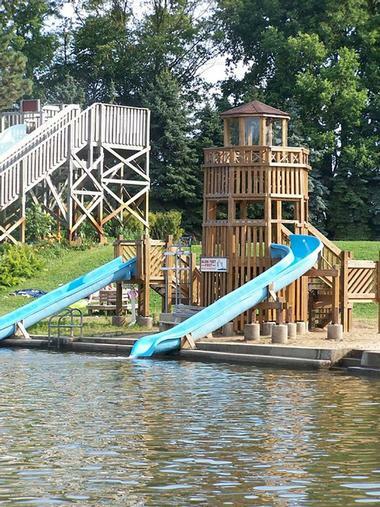 Comprising the original swimming hole which the park was built around, Pine Lake also offers activity centers, water slides, and several other activities to enjoy around the lake. It’s an affordable and fun-filled option which everyone in the family is sure to enjoy. The River Run Family Waterpark is your best choice when you want to do something with friends and family to cool off on a hot summer day. Put away the phones and video games and head out to get some fresh air in the state-of-the-art aquatic center. Toddlers can splash around in the pool made just for them while the rest of the family gets wet and wild on the park’s many waterslides. Spend your day relaxing about the lazy river or getting soaked as you climb aboard the steamboat water attractions. You don’t have to go far when you get hungry as there’s plenty of food, snack, and beverage choices in the many concession stands available there. A part of the Plainfield Recreation Center, Splash Island is a tropical themed waterpark that has so much for the entire family to enjoy during their visit there. There are several attractions including an interactive play area for the little ones complete with kiddie slide, exhilarating waterslides, water jets, pulsating vortexes, ropes and guns, and a lily pad crossing. There’s even plenty of grassy areas and deck space for visitors who just want to sit back, watch the fun, and take in some sun. The park has a six-lane competition/ lap pool for visitors to enjoy which include diving boards and a 900-foot-long lazy river that winds throughout the property. 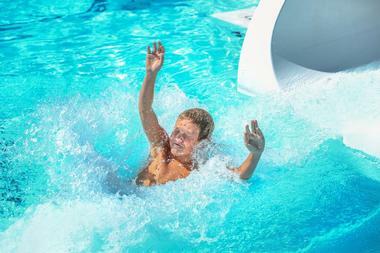 Set on 3 ½ acres, the Waterpark at the Monon Community Center is a one-of-a-kind aquatic experience that has proven to be a popular family-friendly attraction during Indiana’s hot summer months. There are so many things to do for the entire family, from the toddlers who can enjoy the kiddie pool and tot slide to the teenagers who love the thrill of surfing on the FlowRider or scaling the wall of the park’s AquaClimb. Even adults love lounging at the waterpark, as they lounge on the lazy river or take a dip in the lap pool. Additional attractions include an activity pool, a plunge slide, and two curvy adventure water slides. Make the day a memorable one by renting out your own private cabana so that you can make the most of your stay. Head over to Tropicanoe Cove for a taste of the tropics right in Indiana - and all you’ll need is your swimming suit! They offer everything necessary for a fun-filled watery paradise from the leisurely Cattail Crik to the speeding Banana Peel. Those who don’t want to get too wet can lounge on their lazy river or get some sun in one of the many green areas, lawn chairs, or on the cove’s large deck. Re-energize yourself with some delicious food from the cove’s several dining areas. The entire family will find plenty of ways to cool down at Tropicanoe Cove on one of Indiana’s hot summer days.